Think your wedding day will go as planned? Hmmmm…probably not. But that’s okay. The wedding can’t start without you and it’ll be just as beautiful as you imagined it. As Wedding Videographers, we get a rare glimpse into the workings of a wedding day from start to finish. Here are a few things that may or may not happen on your wedding day, but don’t stress, things like these are bound to happen to almost every couple. <Hair and Make-up will take longer than expected. <(Insert business name here) sent one of your Bridesmaids two left shoes. Family friend goes back to the store to retrieve correct shoe and makes it back just in the nick of time. <Does anyone know how to tie a bow-tie? Anyone? <Grandparents are lost. Can’t read GPS. Wedding begins in 30 mins. Mom?!?!?! <The limo is ready for us downstairs and I can’t find my shoes. Mom?!?!?! <Do you have the rings? No, do you have the rings? Who has the rings? <Hair and Make-up will take longer than expected. (Just in case you missed it the first time). <Who’s the officiant? A friend of theirs. Is this his first wedding? Yes. I thought so. <Honey, the officiant needs the marriage license. I thought you had the marriage license. <I shouldn’t of eaten that sandwich. <Do you think the wind will stop blowing at hurricane force by the time our ceremony starts? <Do you think it’ll stop raining by the time our ceremony starts? <Is the flower girl suppose to do that? <Isn’t the ring bearer adorable? Hey, where’s he going? <Where’s the maid of honor? Let me call her. She thought the wedding was tomorrow. <It’s 1:00 p.m. The wedding starts at 1:00 p.m. Where’s the bride? <The rings please. OMG!!! I left them in the dressing room, I’ll be right back. <Don’t let the groomsmen drink before the ceremony…especially on an empty stomach…especially on a warm summer day. Just saying. <After entering the reception room…..Where’s the D.J.? <I told you if we had two four foot cakes connected to each other on the top tier by a bridge it would probably collapse. <It’s Bob’s turn to make the toast. Is Bob wearing a kilt? Is that make-up? OMG. <Now honey, don’t smash the cake in my face…I don’t want to mess up my make-up. Honey??? Sweetheart?!?!? Don’t you dare!!! Ohhhhh Noooooo!!!! <Uncle Tony you’re in the way(processional). Uncle Tony you’re blocking the photographer. Uncle Tony you’re in the video guy’s way now. Uncle Tony….go sit down. <Getting married near the airport? Ceremony lasting 20 minutes? Expect at least 4 airplanes to fly over….loudly. <I really, really, have to go to the bathroom right now. (after about an hour of picture taking…with no bathroom in sight). <Who turned off all the lights? (middle of garter removal/toss). <I told the DJ not to play that song, now (insert Bride’s name here) is upset. <Could someone help my new husband off the bus, I think he passed out. <Where’s the Bride…it’s time to cut the cake. Does anyone know where the Bride is? <Where’s the Groom…it’s time to cut the cake. Does anyone know where the Groom is? <Weren’t they suppose to start dinner at 8:00 p.m.? What time is it now? 10:00 p.m.
<Hey look, a pool….think we should? Should we dare? It’s a rental anyway. Who’s with me? OMG…they all jumped in the pool with their clothes on. So will your wedding go off without a hitch? Let’s hope so. But the odds are not in your favor. Remember, this is Las Vegas. Don’t stress, because after it’s all over, you’ll just laugh about it. All the bumps and bruises that happen that day are what make your wedding day different and special. 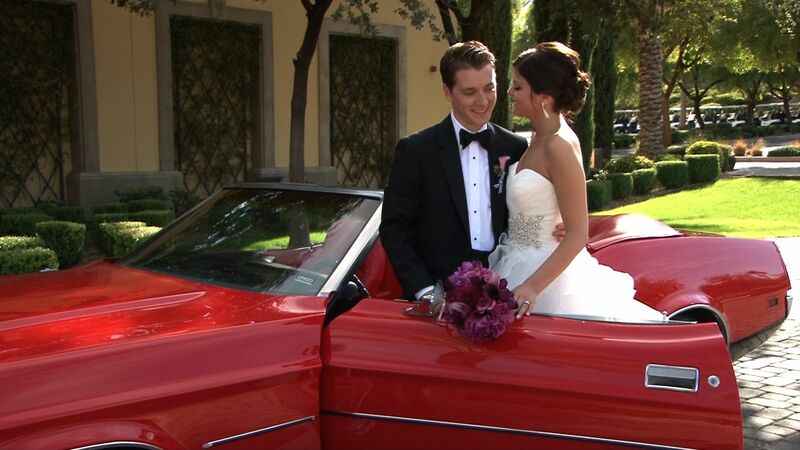 Steve restored this classic Mustang just in time for his wedding day.